Our very large campfire circle. March 1 we left our Winter home in Picacho Peak and headed over to Quartzsite. We have heard a lot about this place over the last couple of months as the big RV show went on and the towns population grew with Winter Residents. BLM land around Quartzsite is a destination for boondockers-intrepid RVers that live for extended periods of time without hookups. We are fascinated by the lifestyle and wanted to experience a bit of it. We are here to attend a Boondocking Rally hosted by Howard and Linda Payne of RV-Dreams. We met the Payne's in 2014 at an Educational Rally they presented in Elkhart Indiana. The information that we learned from them helped us to get started in full-time RVing and we were confident in our ability to learn boondocking skills from them as well. Our first 4 nights in Quartzite were spent at La Paz RV Park-with full hook-ups before moving to the Rally site. Those few days gave us the opportunity to explore this community and to learn a little bit of the history of the area. The welcome to Quartzsite sign has camels on it. It is an interesting clue that camels are an part of the history of the American west. The experiment began in the 1850's by order of Jefferson Davis who at that time was secretary of War. Seventy-seven camels were brought to the southwest territory and utilized as pack animals to build a road from Fort Defiance to California across the Arizona desert. The experiment was moderately successful and might have continued had it not been for the Civil War and the loss of Davis's support. The camels were released into the desert when the program was abandoned and lived there for many years. Tales of camel sightings and of ghost camels have become local legend. The camels handler Haiji Ali (Americanized to Hi Jolly) lived out his life near Quartzite and is buried here. The lost pilot sign is still providing direction in the desert. Out in the desert in a fenced area of sand and cactus is a 100 foot long series of letters that spell out Quartzsite and an arrow with an N pointing North. The Quartzite Rock Alignment also know as the lost pilot sign was fashioned in 1945 for flyers of Patton's Army Air Force who became disoriented in the never changing desert landscape. The arrow pointed to the airfield to guide the novice pilots back home. 73 years later the rocks remain as a testimony to those airmen and their ingenuity. Postun Arizona is home to a more somber point in our history. Colorado River Indian Tribes Reservation land is where 3 of the 10 WWII Internment Camps for Japanese Americans were located. The camps were torn down and all that remains to mark their place is a monument dedicated in the 1990's by the camps survivors and their families. Fred has a friend from his Air National Guard Days that lives in Lake Havasu City, Arizona. We were able to meet up with Jeff and visit for a while. 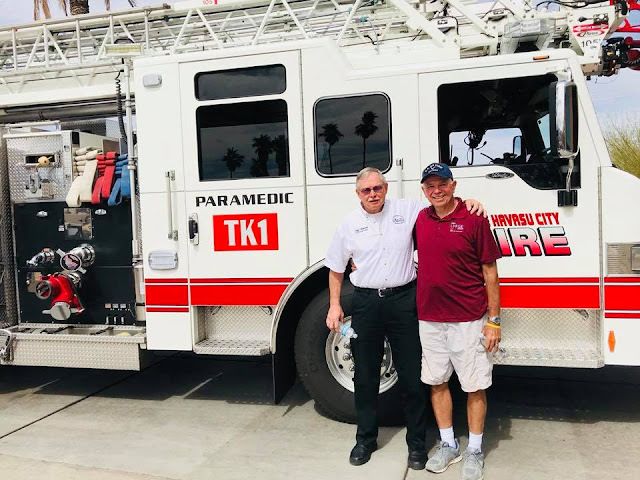 He was kind enough to give us a tour of one of his Fire Stations and to tell us a bit about the history of Lake Havasu. We enjoyed lunch in the shadow of the London Bridge. Jeff suggested a great cafe for lunch with outdoor seating that overlooks the London Bridge. We enjoyed burgers at Makai's and walked over the bridge. 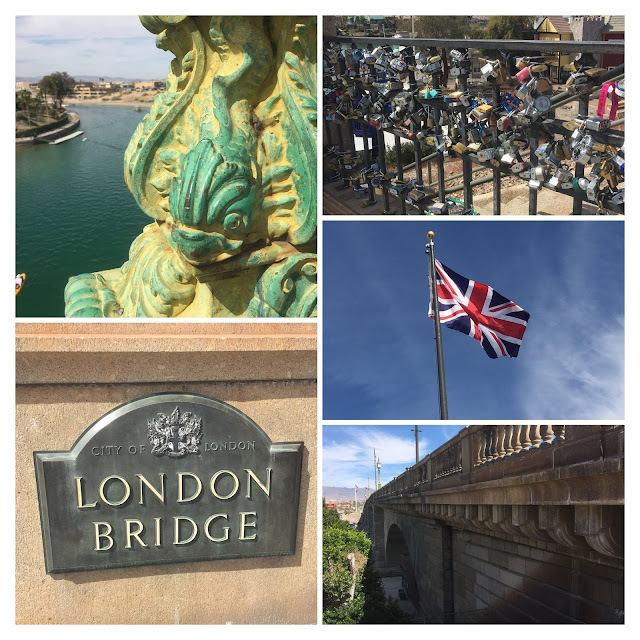 It was fun to see all of the British flags and London Bridge signage as we walked across the river. Monday morning we packed the Behemoth, emptied our holding tanks, filled our water tank and headed over to Plumosa Rd where the Rally was being held. We stopped to get a 14 day permit and found the Rally site where Howard was directing incoming rigs to positions on the perimeter of the clearing facing inward. We felt like we were circling up the wagons for the night. Some earlier arrivals had made 3 fire pits in the center of the circle and there were big stacks of wood waiting for the sun to go down. Fred and I set up camp and went out for a walk to meet the neighbors. We found that most of the Rally attendants were pretty experienced at dry camping and felt like the novices we were at our first rally. The schedule was pretty loose. Seminar's by Howard and Linda on 3 of the mornings, one on one walkthroughs of our unit to give individualized advice and a lot of conversation with others about the problems and pitfalls that can arise if you don't manage your tanks and electrical systems prudently. We had a hotdog and hamburger night, 2 potluck dinners and 1 potluck breakfast during the week. There were campfires and field trips and caravans to the grocery store. The desert sunrises and sunsets were spectacular and the night sky the brightest I have ever seen. We met some great people and hope to see some of them again later in the month at the Reunion Rally. It was a great week. I don't foresee that we will ever be living off the grid for extended periods of time, but it is nice to know that with a little pre-planning we can pull into a remote or rustic campground and stay for a week or so. We are planning to do a little more boondocking this summer, Bonnie. Looks like you had a great time! We enjoyed it. I am interested to hear of your off grid experiences. We will only be overnight boondocking at Harvest Hosts locations for the next little while but this Summer plan to take the boys to a rustic campground on Lake Champlain to practice our skills. Just getting caught up on your blog. I follow a few that were also at the rally; so nice to see the bunch of you together and read about the rally from different points of view. Thanks Mark. It was a good experience. Glad to read that you and Karen are getting closer to the dream.